Avast ye me lads and lasses. Yer favorite app pirate is here again to give ye another dose of app review that me know ye are waiting for. Me and the crew are not just experts in finding booties; but we are also excellent fighters! Aye, all the other pirates back down when they see us. Har, har, har! Whenever I’m in a battle, I would think of me favorite action character Rambo. One app reminded me of that character and that’s what I will share with ye today. The title of the app is called Ramboat and it was developed by Genera Games. Ramboat deserves applause when it comes to the graphics. The game background changes from one stage to another and each stage is detailed. For instance the first stage, which is the jungle; will immediately that it is a jungle. There are trees, plants, bushes, and rocks. There’s also the cherry blossom stage that would make you feel that you are in Japan, because of the famous pink tree. 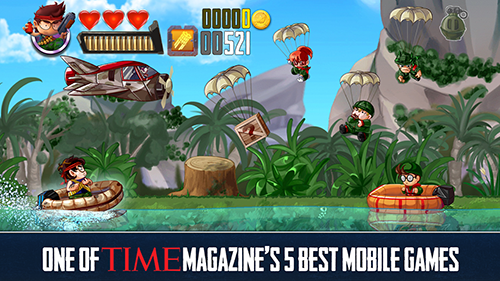 While the main character is Rambo, you can also unlock other characters that you can use on the run. Plus, there are a lot of weapons and vessels to unlock, which are all well-designed. Even the animation was done excellently. There are various enemies that attack from different positions, including the waters and those that are being dropped from above. This game is exciting because it will make you feel on edge as there are lots of enemies to take down for the hopes of getting to the next stages. It’s a combination of running and shooting games. If you are into action, then this app will not disappoint you. It’s like an endless runner where you need to start from the beginning if the game ends. Lives are also slow to regenerate and using a gem will not fill up your lives; instead you will only get one. It has no pause or save option, which means that you have to continue playing it until it ends or you just end it right away if you need to do something, which can be frustrating, especially if you are already on higher stages. This app is available for download for free. However, the advertisements can be too much and they may affect the overall game experience. Ads are just normal on free games, but they don’t at least have to bombard the game. Ramboat can be played for free. It has exceptional graphics with detailed and changing background. There are various characters, vessels, and weapons to unlock. There can be too many advertisements and the lives are slow to regenerate. Using a gem for your life will only give you one life instead of filling up all your lives. 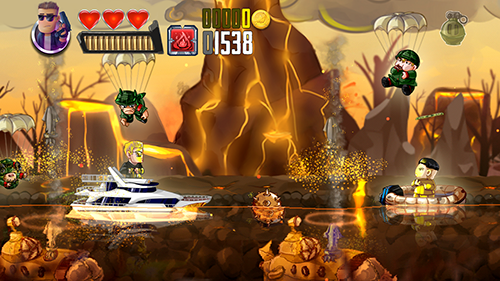 Ramboat is generally an exciting and fun action game. It may have some drawbacks, but considering it’s free, it is not a bad option with its excellent graphics and action-packed adventure.